Desert have always fascinated the English and obsessed many of its greatest explorers including Jack Philby (father of the infamous Kim Philby and one of the mid wives of Saudi Arabia) Gertude Bell (one of the architects of modern Iraq) and Wifred Thesinger(chronicler of the Marsh Arabs). Their books are fascinating and compelling and a recent visit to the Algerian Sahara helped me understand the pull that the desert has on our and their imaginations. Now Algeria has had as many readers will know a very troubled history in recent years and as a result the tourist industry in Algeria has all but collapsed. While this is economically problematic for the locals it has the advantage that it gives the occasional visitor a frisson of excitement that is rather exaggerated as the Sahara is probably less dangerous for foreigners than visits to rather more popular destinations. Readers looking for exciting stories of close encounters with evil Islamic extremists will therefore be rather disappointed as I still have my head and the story is one of kindness, consideration and gentleness with a little pain in the neck bureaucracy added in to add colour. 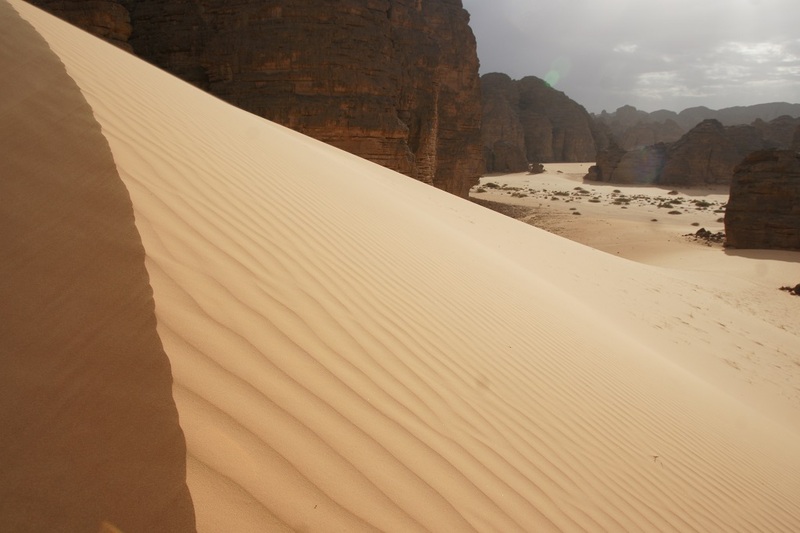 In the deep south of Algeria near the Niger and Libyan borders lies Djanet a rather dusty and bedraggled town that is an entry point into what is one of the most beautiful parts of the Sahara namely the Tassili N’Ajjer national Park on the border with Niger and Libya. Our vision of a desert doesn’t prepare us for the diversity and interest that is the reality. Colours of sand range from white to orange to red to deep brown and volcanic black, dunes some hundreds of metres high tower over you in all their sinuosity with curves so delicate as to confirm nature is our finest architect. The desert surface runs from basaltic rock so rough that bare feet would be ribbed apart in minutes to sand so soft gentle and inviting as to make Asian foot massages redundant. Rock are sculptured into a diversity of exquisite shapes of such grace and apparent fragility to have made the great British sculpture Henry Moore envious. At the same time the heat during the day and the cold at night remind us that we are in an environment that doesn’t accept mistakes easily. Ultimately its nature that is in charge and man is there by sufferance. The rock art of the Sahara, while not aesthetically to the standards of that to be found in the paleolithic rock art to be found in the caves of France and Spain, nevertheless demonstrates, particularly in its earliest manifestations, the harmony and diversity man found in nature. The focus is on representing the natural world. The elephants, the giraffes, the antelope , the rhinoceroses are from the time the Sahara was verdant savanna with migrating herds moving from one watering hole to another. It is clear that man was seen as subordinate to the natural world and as part of it. This is something to ponder on as we enter the Anthropocene age where man’s activities play an increasingly important role in the earth system in a way that is unprecedented. 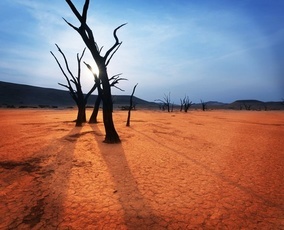 Sadly the Sahara is also not immune to such effects. Those ubiquitous product of the modern hydrocarbon industry namely the plastic bottles and the plastic bad, the quintessential symbols of man’s assault on nature, are to be found lodged for perpetuity in what at first glance seems to be the most pristine of desert environments. Funny when one thinks about it. Algeria’s oil was being extracted just north of where I was and just a few hundred kilometres from its starting point it returned to litter the Desert. If our link to nature are what strikes one in the Desert then so is our lowly position in the total order of things. Sleeping in the open under the immensity of the night sky one is humbled as the milky way and the millions of constellation pass above unobscured by light pollution of the modern world. Our ancestors saw what we see too seldom in the modern world. We are insignificant nothings sleeping on an Earth that slowly rotates in the immensity of boundless universe. Yet that is also not true! I decided to take an early morning stroll in the Desert while our encampment was still sleeping. The silence was so total you could hear it as the winds were not yet on the move. I broke my personal silence by plugging into Chopin’s nocturnes. Walking away into the apparent nothingness that is it the immensity of the desert, accompanied by the music of such a master, was an experience I can never forget (by way of disclaimer I was not into the local weed so it was not the after effects of a good smoke). One was entering eternity where the individual and the universe were one and where you as a conscious being was both nothing and everything. That morning I recognised why Islam a religion created in the desert and emerging from the desert was so powerful for its original adherents. It was the dwellers of the Sahara the Tuareg, or Tamasheq as they are more correctly called, who were one of the driving forces behind the original expansion of Islam in North Africa. Ignoring its perversions and conflicts its simplicity reaches the sublime where man and the universe are united. I also recognised why the early Christian ascetics we know as the Desert Fathers were so keen to get themselves into such harsh environments. The desert tells us the truth if we let it! The Tamasheq were the hosts for my visit (they are very strong on not being confused with Arabs who form the majority of the Algerian population centred in Northern Algeria along the Mediterranean). They are the desert dwellers to whom the Sahara is home. Wearing veils and emerging from their desert oasis to raid and trade they are the stuff of children’s adventure books and myths of the French Foreign legion. To them the desert is not a barrier but rather a highway as for centuries they dominated the trade between sub Saharan Africa and the Arab North. For bureaucratic reasons namely that you had to have a guide with you in the South of Algeria regardless of whether or not you wanted one (security reasons were quoted but I have my doubts) your correspondent decided to stay in this dusty town rather than move on. 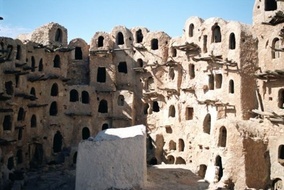 It is one of those Oasis towns from which the blue people, as the Tamasheq were known because of the indigo that leeched from their veils, would emerge in days past to terrify adjacent peoples. It was a fortunate decision because it enabled your correspondent to come closer to these figures of myth and in that closeness one found a generosity of spirit and openness. It is a sad thing but the commodification of human beings in the exchange process that is tourism is dehumanising for both sides to a transaction however economically beneficial it may be. (Apparently Polish visitors are liked as they respect the values of the community and do not treat the locals as merely service providers as do the French and the British and I do not think my Tuareg hosts were just being polite!) Psychological studies confirm that money has a habit of undermining social relationships and the normative value of what is being done. Therefore being invited to home as a friend not a visiting tourist makes a significant difference as barriers between the client as a paying customer and the host disappear. Sharing the same plate and the same food cannot but breaks barriers. Particularly striking to me was the role of women in what is a traditional Islamic culture. Veils are not worn, women were not hidden and it is they who own property. Tuareg society is structured on matrilineal lines with women enjoying high status by comparison to that of patriarchal Arab society so never think that Islamic culture is necessarily about female oppression, it is not. What was also very attractive to me as someone from England was the way families remain intact with the old, the sick, the young and the mentally ill remaining integrated within the home rather than being shunted off for others to deal with as in Western Society. Finally to the music of nostalgia. 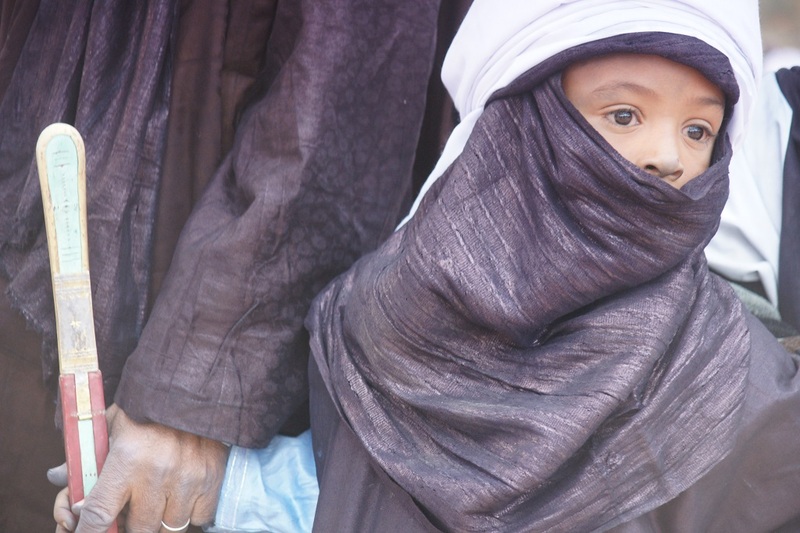 The Tuareg were once a nomadic warrior race with the pride and self esteem that comes with that sense of identity. Like many small nations they dream of an independent homeland known as Azawad. One slight problems as the Kurds have also found is that their ideal homeland just happens to be divided between four colonial era countries namely Mali. Niger , Algeria and Libya. 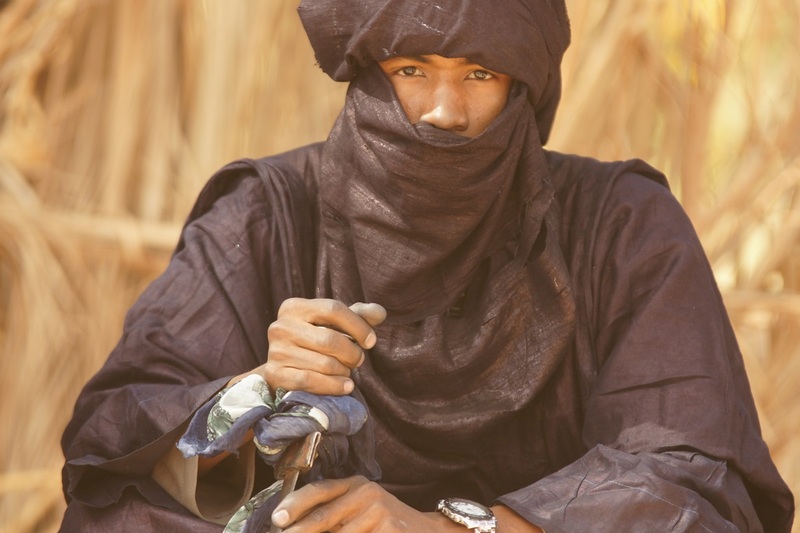 The Mali Tuareg decided to have a go at creating an independent Azawad with weapons obtained following the collapse of Gaddafi. It just happens that Mali is the main source of France’s uranium which is extracted from mines located on Tuareg ancestral lands. The Tuareg rebels then blew it because they made the fundamental mistake of aligning themselves with an Al Qaeda affiliate who ate them up, spat them out and left them without any international friends. The French subsequently rushed in to support the Malian government to safeguard uranium supplies for their nuclear industry so bang went any hope of an independent homeland. The Islamic extremists also made a further fundamental mistake in alienating the locals by banning music in the Tuareg areas they occupied. Now music is fundamental to Tuareg culture (the international famous but currently defunct Festival au Desert in Timbukto being one casualty of Islamic extremism). Young and old Tuaregs go into the desert, make a fire, brew tea and sing for hours on end until the stars break. It beats going to the pub I can tell you. The response to the collapse of Tuareg ambitions has been an explosion of music throughout the region with bands such as the internationally acclaimed Tinariwen and Djanet’s own Tissilawen building a musical culture that has an international following. The aim is independence through peace and music. It is called the music of nostalgia and truly it is. For a homeland that will never be and a desert that is slowly dying under the weight of climate change and exploitation. But nevertheless when I hear their music it will always bring to my mind those nights around a desert fire, drinking tea and falling asleep under the stars to rhymes and a silence that tell you that you are one with the universe. But now it is time to say goodbye to my Proustian reveries and return to a world full of Trumps and Le Pens. Oh well, such is life. But it was great while it lasted!